Introduction EMSL Analytical, Inc. is recognizing it's Orlando Lab for its AIHA Legionella accreditation. EMSL Analytical, Inc. is pleased to announce that its Orlando laboratory is now certified for Legionella analysis through the American Industrial Hygiene Association (AIHA-LAP, LLC). EMSL Orlando is in compliance with International Standard ISO/IEC 17025:2005 policies and procedures along with offering high-quality testing services to its clients. 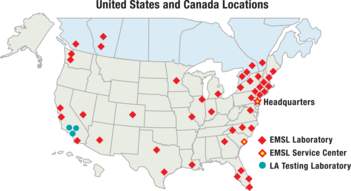 Nationwide, EMSL is the leading Legionella testing laboratory with 20 CDC ELITE certified locations, including Orlando, throughout the United States and Canada. Legionella can cause a very serious form of pneumonia known as Legionnaires’ disease, which often has long-term health effects such as cognitive decline and debilitating fatigue long after the patient is released from the hospital. Legionella can also cause a less serious flu-like illness known as Pontiac Fever. Along with Legionella testing, EMSL Orlando offers asbestos and microbiology testing services. The laboratory is certified by the American Industrial Hygiene Association (AIHA-LAP, LLC) for testing through the Environmental Microbiology Laboratory Accreditation Program (EMLAP) and Environmental Lead Laboratory Accreditation Program (ELLAP). EMSL Orlando is an AIHA-LAP, LLC Environmental Microbiology Proficiency Analytical Testing (EMPAT) participant for fungi and Industrial Hygiene Proficiency Analytical Testing (IHPAT) participant for asbestos. The Orlando lab is also certified through the AIHA-LAP, LLC Environmental Lead Proficiency Analytical Testing (ELPAT) for paint chips, soil, dust wipes and air testing. In addition, EMSL’s Orlando laboratory is accredited by the National Voluntary Laboratory Accreditation Program (NVLAP) for bulk and airborne asbestos analysis. The laboratory is accredited by the State of Florida Department of Health, Bureau of Public Health Laboratories for asbestos testing in drinking water. For service questions, please contact EMSL’s Christopher Goulah, Ph.D., for expert information at 716-651-0030 extension 1407 or Diane Miskowski, MPH, at 1-800-220-3675 extension 2528. To view a complete list of EMSL’s laboratory locations, accreditations and capabilities, please visit www.EMSL.com. For more information about EMSL’s testing services, please email info@EMSL.com or call (800) 220-3675.